Happy Labor Day! 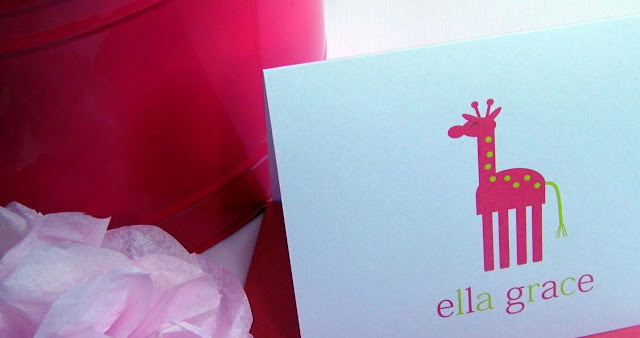 To celebrate The English Pea is offering personalized folded note cards for two lucky Grosgrain winners! All of their designs are original and made in vibrant, fun colors. AND FOR ANYONE WHO WOULD LIKE TO ORDER NOW, the English Pea is having her bi annual Stock Up and Save Event. 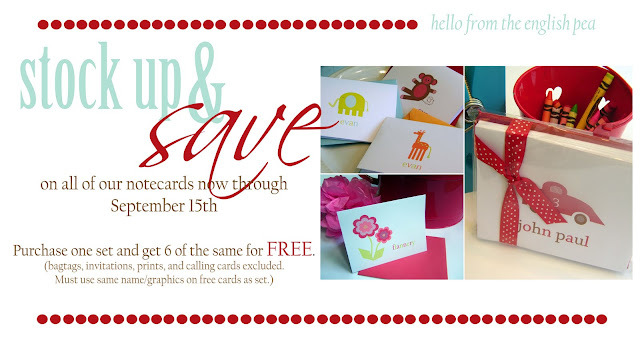 For that 15 day period any customer can order a set of notecards and receive 6 of the same notecards for free! I am already a follower. Thanks for hosting an awesome giveaway. Love & blessings from NC! I love your notecards. They are so adorable. Please count me in on the giveaway. Love & blessings from NC! I'm a follower & I'd love to win! What a fabulous stationary company. The English Pea has wonderful notecards and stationary. I highly recommend their products!! I would love to win these! I love cards! Oh so cute. I'd love to win. Thank you! The peas and carrots note cards are so cute! Thanks for the opportunity. Beautiful! The perfect gift for my letter writing friend who brings delight to my mail box at least once a month! hahaha I have been following you for ages. But I really would love some personalized note cards. I'm a teacher so I'm sure I could find a million and one uses for them: notes to parents, principals, other teachers...ect. btw I love your 'frock by friday' posts, I have yet to sew my own friday frock but you have inspired me to attempt to sew a Burda pattern!!! Oh, those are so much fun with the bright colors! those note cards are just darling!! These are lovely! I'd really enjoy having a set. Very crisp and clean designs, I love them! I follow and RSS feed:) THANKS for the chance to win! 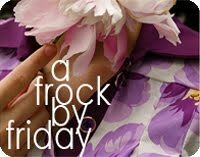 Love visiting this blog--great stuff! Hope that counts:) Thanks for the chance to win! Oh wow, I love their stuff! Love personalized stationary. AND I'm a follower! I love the apple card. I have a friend who is a teacher and these would be amazing for her as a Christmas gift! I tried to "follow" you and it said unable to do so at this time? I will try again later! Thank you for this giveaway! Cute card sets! They look very versatile! giveaway!!! follow me.. in my blog.. and play! I'd love to win this! How fun...I love the 'Mrs. Smith' one. I love the apple! 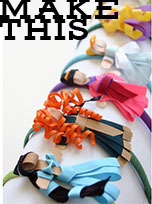 I am a follower of Grosgrain! WaHoO!!! Lovely designs! I'm a sucker for cute cards! Hi there! 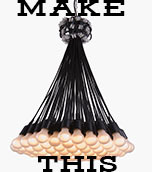 I follow Grosgrain on Google Reader! I am a follower of yours! The cards look so cute, I've been looking for some new cards for when I need to send little thank you notes or just a little hello to someone. OH MY GOSH..I absolutely love these! I love to keep a stash of blank cards around for family and friends. How great to have personalized ones this cute! Those are so cute! Thanks for the great giveaway! the prints and colours on the cards are awesome. i've been a follower of grosgrain. Very cute designs .. . These are so cute. I would love to give one to my family members. So sweet. Thanks for the giveaway! I follow you. And not just for the second chance at a giveaway. The English Pea has so many cheerful and adorable stationery in the shop! I follow via google reader, thanks for the sweet and lovely giveaway. How lovely! I particularly like the monogram. I love these letter sets. So cute! I'll keep my fingers crossed! I would love these little cards! They are so creative! I love these fabulous notecards! Would love to win, thanks! I love English Pea! Thanks for the giveaway! I love this giveaway! I'm a newleywed and this would be great for our new cards as a fam! I have been oogling over the English Pea's designs for a while now. Love them! Oh how adorable!! I'm already a follower! Crossing my fingers! Those are just too cute! Those are so cute and simple. Thanks for the great giveaway! They are so cute! So pretty - I love her designs! And stationary! So cute! Thanks for offering the giveaway. Those are so cute and a girl can always use some personalized stationary. These are adorable! I love them all! Oh, I love these designs!!! I am constantly writing notes to relatives; if I won these would be put to good use! Oh So very very Cute!!! I love notecards! I super love notecards. So cute!! I'm fond of cards! I take a chance!!! many many thanks!!!!!!!!! And I am following Grosgrain! 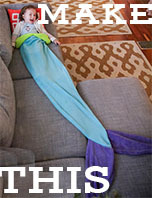 This are so adorable and I'd love to win! I love the For the Birds and Under the Sea notecard packs. Fantastic pls enter my name thanks so much !!! I am a follower of yours from Barcelona! I am a blogger & twitter follower! I love how cute these are! Thanks for sharing! Those giraffes are too adorable for words! so cute and adorable ! i'm a follower, and love these great cards. Thanks for sharing. Wonderful cards! Would love to have some!